The trio have come far since their early days in an underground practice space at New York State’s Binghamton University. 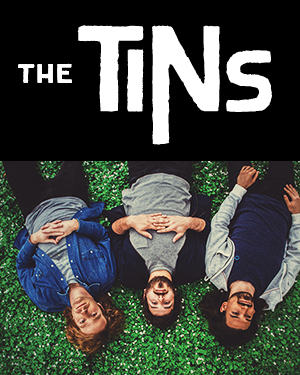 The Tins first single, “The Green Room,” became a staple of the Spotify Hipster International Playlist, and received Spotify staff picks #2 song of the year. Life’s A Gas, their debut full length, was written by the band with Modest Mouse producer Joe Blaney. Since then they’ve gone on to work with producer Ted Young (Kurt Vile, The Gaslight Anthem) and have garnered millions of plays across all streaming music services. Written initially by the individual members in their respective, sundry garden patches, the songs of The Tins blossomed into their full glory when the band came together to jam in their weird, and possibly haunted practice / living space in the small loft above Mike Santillo Senior’s trucking company. The bulk of the record was tracked at GCR Audio in Buffalo NY, apart from a cover of Bruce Springsteen’s “State Trooper”, which was recorded at Santillo Jr’s new Mammoth Recording Studio. The record incorporates a myriad of found sounds, from that of a man playing a high-pitched flute, known as Khlui outside of Chiang Mai, Thailand to a group of children singing outside of the giant Catedral del Cuzco at Plaza de Armas in Cuzco, Peru. Additionally, Takac jumps on for a cameo appearance on the Shamisen, a Japanese string instrument whose body can be played like a drum.